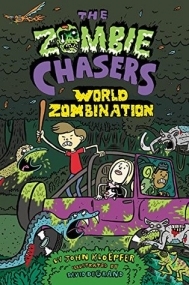 In the final book in the beloved Zombie Chasers series, Zack Clarke and his zombie-fighting team travel across the world in search of an antidote that will stop the brain-gobbling outbreak once and for all. With all the middle school shenanigans, fast-paced adventure, and hilarious black-and-white drawings that have made this series a favorite of reluctant readers everywhere, The Zombie Chasers #7: World Zombination is an uproarious, gore-streaked finale that readers will love! From taming zombie jungle animals in Madagascar to unearthing zombie mummies—zummies—in Egypt to battling black-belt super zombies in China, it's the zombie chasers' slimiest adventure yet. Will the kids be able to get the antidote and unzombify the undead masses once and for all? Or will the putrid planet fall to the zombie scourge? Can Mayfly Larvae Save the World? Scientist Nigel Black has sent the group to Madagascar to find mayfly larvae as the final ingredient for his antidote to the zombie plague. The group flies a plane there, hoping to come back quickly so that they can save Ben, who has been turned into a super zombie. They meet Nadie, whose parents are wildlife conservationists in Madagascar, and she helps them find the larvae, as well as fend off some of the zombie animals with her wooden pan pipes. When the group has accomplished their mission, they get word from Nigel that they also need more gingko biloba-- and not just any gingko biloba. They must travel to China and find an ancient tree. Getting gas for the plane and flying it there proves problematic, and they crash land in Egypt, where they have to ride camels and go through a zombie ridden bazaar. They also end up in a tomb of zombified mummies when the jar holding the mayfly larvae bounces out of their reach! Twinkles the dog saves the day, and the group is off to China, where they meet kung fu master Zhang Wu and learn vital zombie fighting skills from him. There is a close call when Zack is bitten, but the group gets their supplies and heads back to Nigel's island, only to find that the scientist has also fallen prey to the ever insatiable zombies. Will the group be able to prepare the antidote and disseminate it widely enough to save the world? 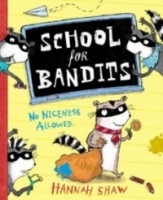 There aren't many middle grade novels where the characters get to fly planes to Madagascar, Egypt, China and the Bahamas! This makes it easy to turn the page to see where the group will be going next, and what group of evil zombies will they meet! The illustrations are perfect for the book-- both goofy and gory, they won't give younger readers nightmares, but are gross enough to keep tweens reading. Now that this series is finished, readers will have to join Kloepfer's characters in The Galaxy's Most Wanted series, and older readers can continue on into more serious zombie tomes such as Shan's Zom-B or Higson's The Enemy series.